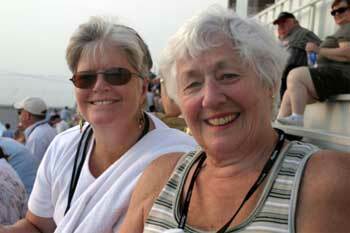 Sue (left) and Fern Risely ath the Phantom Regiment's "Show of Shows" this past June. Last week we called drum corps fans to "spread the word" about drum corps to the uninitiated -- invited longtime fans to become marching music evangelists. Sara Risley of Wauwatosa, Wis., wrote in with this "drum corps initiation" tale. I myself am a recent convert to DCI. A friend's son marched with the Glassmen and his stories turned me on enough to go to my first show, and it was all over for me -- I am hooked! I have been to every Finals since then (2002) and have my tickets for this year. Last year I dragged my mom and sister, Sue, to Phantom Regiment's home show. "The music was good" they agreed, "but we aren't so sure about those people with the flags running all over the place." Somehow they were still quite willing to join me at Phantom's home show this year. We did the VIP thing and got our barbecue and wider seats (a couple of our butts needed that) and our PR seat cushions. After the show this year (where they didn't say BANDS once!) they agreed that, "We kinda get the flag people -- they are pretty cool after all." I was delighted! And the world gets smaller. My sister this year had an extra reason to enjoy. Her best friend from high school's daughter's college roomate at TCU is marching with Phantom this summer. We met up with her and sister Sue did the appreciated thing of bringing her Gatorade. She was delighted! So -- converts? I don't know, but they all ask about Phantom, The Cavies and the Glassmen quite often." We're asking each of you to reach out and spread the word about the drum corps activity. Knock on doors, e-mail, instant message, even yell if you have to -- but this is the summer for you to bring a friend to a DCI show. Bring a digital camera to the show and take a picture with your new drum corps convert at the show, and send it to dave@dci.org -- we'll post pics as they come in under the headline, "New convert." Great seats are still available at most DCI shows. Pick up the phone, make your pitch, and we'll see you on the 50.